After countless bits of paper calculating amounts for the daily/bi-daily sourdough bake I've resolved to write an app to do it instead (web app, aka website). I very seldom use commercial yeast and often have either too much starter or too little, and must adjust my proof time accordingly. A record of proving times of all my previous bakes and their ingredients/hydrations etc, as well as a way to quickly enter them and maybe even view their trends, would be singularly helpful. Also something to instantly tell me how much flour/liquid to add after starter, given hydration and bakers' formula (or whatever it is called, the one where flour is 100%). Does anyone know if someone has written such an app already? On any platform. Especially if it was free. > given hydration and bakers' formula (or whatever it is called, the one where flour is 100%). I've considered building something like this, myself, on occasion, but always come back to the ugly fact that it's such a huge data-entry problem rather than anything else. And for the most part, due to the way Baker's Percentage works, most bakers with enough experience can do all the math for their formulas in their head, an interface/UX that is pretty hard to beat. Wow, robust indeed! I like it. Though not as much focused on length of proving time as I need - I'd like one day to be able to look at my previously recorded bakes and say okay, I have 40 hours until this bread needs to be fermented, baked and cool enough to slice, what % starter am I going to need? I think my problem is the math part. That was never my strong point. I've written out 400g flour x 0.7 (the long way) more times than my pride will allow me to admit. What with a toddler and 2 month old dividing my attention during daylight hours, I could use all the help I can get! The math of the formulas isn't too hard, there's not much that's actually too complex. The biggest issue I have come across is compensating for working with a sourdough starter. The number of factors that influence the strength and activity of a starter are so great that it's going to take a good deal of understanding to make any valuable calculations about using starters. Out of curiosity, what technology stack are you planning around? Yeah, I agree completely, as a matter of fact. But hydration is something that gets pretty tedious to recalculate every time if you forget things easily (as I do), especially when you are using different amounts of starter from day to day, all other things being equal, to achieve the proof time you need. And it would be so very nice to be able to predict those proof times more accurately, or at least have an idea of how inaccurate your prediction is going to be. I don't have a proofing box and other than the proof happening just generally "faster" on warmer days (for example) it would be helpful to have a more fine-grained idea of how fast we are talking, for my particular starter. I'm coding on a LAMP (php) stack on Ubuntu 12.04. Though now I'm wondering if I shouldn't try redoing it in ruby since this is a for fun thing. Beautiful and comprehensive app. Looks very mac too :P.
I'm really more looking for something that will let me keep track of, say, proving times, and see patterns from previous bakes. As a hobbyist bread head, my main interest is how to use the starter I have with the life I have, which involves a husband, two very little girls, other things to do in my daily life (such as laundry, meals, church, extended family) and not enough time in the day to sit around poking a boule to see if it's fully proven yet! I'm most concerned about proving time but other aspects like kneading or initial oven steam would be within my realm of interest too. I suppose the perfect app I'm looking for would track my bread experiences more generally and qualitatively (under/over proving, under/over kneading, refreshing starter 2:1:1 vs 1:50:50, etc) rather than primarily to record a formula: "What happens to the bread when I do this?". Of course the proportion of ingredients would be important too but methodology is the thing I struggle with most. The real benefit is that I could look back and see trends of bread response. Breadstorm looks amazing, but it seems to have a different purpose from what I'm looking for. You will have to write that one yourself. I am confident there is no such app out there for the home baker. However,I am pretty sure you will struggle less and less as you bake more and more, making it so that by the time you wrote the app and put in enough data to get your trends, you won't need it anymore because your intuition and experience will tell you what you need. Really, if you made up a set of index cards for each formula you bake and include the times you intend to do things, the actual times you did them, the temperature of the room, the water and the flour, as well as the temperature of the dough at each stage prior to bake and the temperature and time of the bake, and then add a column for Poor, Good and Excellent, you will have exactly what you need after a bunch of bakes. Just take the cards that read "excellent" and now you have the process you need to follow for any given formulation and environment. Hah - most likely! But it provides good motivation to get back into coding, which I have taken a break from since having aforesaid small children. And if it would be helpful to no one else, at least it might help me. I have attempted many other similar apps, none of which came to fruition, so I'm quite prepared for the possibility. Your suggestion about index cards is more or less what my database looks like at the moment :) unfortunately I am a bit of a perfectionist and would like to know not only "a good process" but what each factor contributes to make it good. That would seem to require being able to separate out factors as well as combine them variously to be able to see their effects clearly - possibly not the strongest point of a set of index cards. I do not want to discourage you in any way and would love to see the final product. As every starter doubles at a different rate, I think that, at a minimum, you are going to have to watch that starter and know how long it takes to peak after a feeding at a given temperature, so you can have your computer work its magic based on those inputs as well as the time of last feeding and the temperature of the starter/room/water/dough. And as long as you are making fantasy a reality, you'll want to code for the type/quality of the flour being used to feed this whole thing, perhaps based on ash content and other factors explained in the bread science books. Great idea and good point about the starter! Thanks for the camaraderie too. I had in the back of my mind ash content was going to be important, though as I personally am using the same brand of flour for everything and am not likely to change that, I had relegated that to a later (hypothetical) release. Like David, I think you will have to write that app yourself. With a busy schedule you can save yourself some headaches and time by keeping your starter low maintenance in the fridge, instead of high maintenance on the counter, and cold retard your dough overnight. And, if you are wise, you will not forgo poking the dough to judge whether it has proofed sufficiently or not. I bake some of the same breads every week for sale, and even though I streamlined the procedure as much as possible, there will be always variables that interfere with accurate proofing times. Oh yes! Thanks for the reminder - I do not ever intend to stop poking bread, even if just to keep learning about the texture and response of the dough. What factors do you think interfere wih your proofing times, accurate as they may be? I agree the calculations are too tedious to do by hand. I'm writing a PC app that should automate the process. It's past the half way mark but my time to work on it is decreasing until about the end of May so I don't think it will be finished before sometime in the summer. 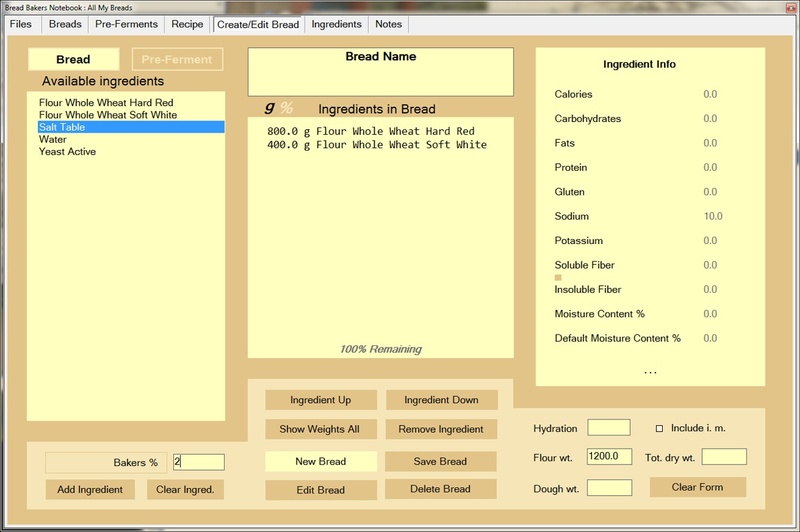 Here's a screen shot of the page where breads and preferments are created and edited. After a preferment is created it is added the ingredients list. I am also working on an app - pc, mac, ios and android. It is working great for me keeping track of everything I am baking. When do you think it will be available? I keep pining at the ipad breadstorm app, but can't justify the expense of it. It is actually pretty close. It is actually pretty close. It just have some fine tuning and making sure it does everything I want it to. I am adding some features that I haven't found anywhere else that I want for my use. Here is a calculator I have written for sourdough. It flollows the BBGA format but has been modified to calculate dough and starter hydration. It is also "weight unit neutral". The BBGA format works in kg only. You will have to deal with the recordkeeping yourself. You could download this Google spreadsheet and handle the recordkeeping on your own computer. To make yeasted bread you could probably substitute the weights of the dry yeast and the water used to dissolve it for "starter". Any word on how your app is going? If you download "za calc" you will see that there is a sourdough calculator that lets you plug in stages of the build, hours and temperatures, and then calculates the weight/% of starter needed. While intended for pizza dough I think it would work for any dough. Their is a spreadsheet with the underlying data available at pizzamaking.com which may be useful for recreating whatever module you may want in your own app. Thanks for the hint! In the last month I've gotten slammed with multiple design projects that are starting to finally slow down. I set up a jekyll site with a basic design in April/May, and having not worked further on it, that's where I still am. What's za calc? I tried to google but just found South African sites. The spreadsheet sounds helpful - I couldn't find it though? IOS App in the app store. Might be zacalc without the space. The spreadsheet can be downloaded and copied here. I have been using my app for a couple months - seems solid. I have a few features I want to add though. Have you published it anywhere for others to try? Not yet - I am still refining and testing. Is there some particular feature you are looking for? any news on the apps? Hi there, I stumpled upon this conversation because I'm looking for a sourdough bread baking journal-type app that will help me track not only recipe's ingredients but also timing of different stages of the dough development and maybe even log temperatures. I've found the "ZaCalc" app for pizza dough and that is really great for calculating and tweaking recipes, and it proposes a sourdough % based on time/temp info. Haven't used it for bread recipes yet. And I've also found a german app "Back Planer"that allows you to fill in a whole set of actions, each with timing and helps calculate back from the time you want to do your next bake. Nice thing is that it offers notifications for when your dough needs some attention. Very handy indeed. But both apps lack in the journal recording dept. I have an espresso shot app called "perfect shot" that tracks coffee-making (with an espresso machine) and really helps to improve shots and recall grinder settings from previous times you worked with a certain type coffee bean for example. I really wonder in what stage the apps of Edo Bread and ccsgd are at this moment... they definitely sound promising! But I didn't discover them in the appstore. If they are not out yet, any chance I can help test them before final release? Hi, I've just brought my starter back up to speed since moving countries with (now) three small children. When I first started this thread apparently I had only a toddler and a baby! My app idea has unfortunately remained only an idea and has been on hold for the last year as we prepared for the move. I for one am still interested to know of any upcoming apps, though. Would you be willing to beta test my app? I hope you find it interesting. And of course, i'm open to receive any feedback! Here is a good app for iOS (iPhone or iPad) to handle recipes and control baking process (with reminders) - Break Baker (here is Apple AppStore link). You can use for free to keep and share recipes and use timer/reminder with a very inexpensive subscription. Subscription includes free 7-day trial.